Only four millimeters in length, Germany's millirobot can be swallowed or injected into the body, then controlled with magnetic waves. Take two robots and call me in the morning. That may well be a legitimate prescription for future medical patients, thanks to a new kind of radically miniaturized soft robot that can be swallowed, injected, or inserted under the skin. The robot can then move around inside the body to target specific tissues or deliver precise doses of medicine. Researchers with Germany's Max Planck Institute for Intelligent Systems unveiled last week details of the tiny robot in a paper published in the journal Nature. Unofficially dubbed the millirobot, it's a flexible, fabric-like robot that can walk, swim, and even carry cargo, despite having no mechanical elements or batteries. The secret is magnetism. 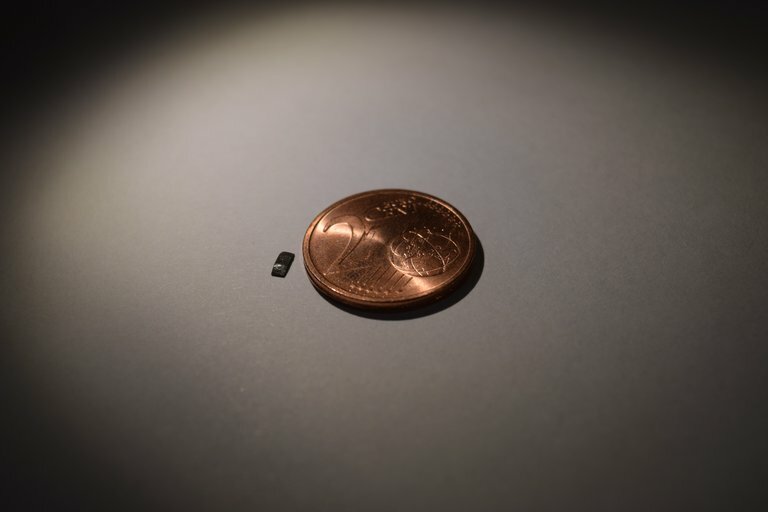 The millirobot, which resembles a very small rectangle of paper about four millimeters in length, is made of an elastic polymer threaded through with magnetic particles. Using existing magnetic-resonance technology, such as an ultrasound machine, doctors can control the movement of the bot inside the human body. That means the robot can potentially be deployed anywhere that physicians need to deliver a particular drug or other medical material — in the digestive tract, say, or even within the blood stream. Emailing from the Max Planck Institute in Stuttgart, Germany, lead author Metin Sitti said the tiny soft robot can be used in different ways depending on where it's needed inside the body for drug delivery or other therapeutic use. While other ingestible robots have been developed, the millirobot has several advantages over other techniques, according to the research team. Most importantly, the robot is very versatile in its modes of locomotion. Thanks to its biologically inspired design, the millirobot can easily transition from swimming in a liquid to scooting over a solid surface. Thanks to its biomimetic design, the millirobot has multiple ways to get around, Sitti said. In a video released with the research publication the millirobot is shown inching along like a worm, swimming like a manta ray, and carrying cargo by encircling small objects then rolling them into place. Sitti and his research team have further plans for the millirobot, including possible cancer treatment options and a novel cauterization technique. “As another medical use very soon, we could heat the robot in the target location remotely — using electromagnetic waves — and the heated robot could stop bleeding in a wound or kill cancer cells locally,” Sitti said. The researchers hope that their soft robot will some day become a standard option for health care providers, offering a space-age option for non-invasive access to hard-to-reach places.